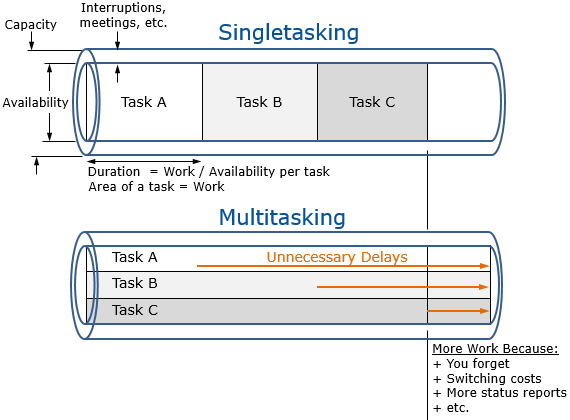 Much has also been said, especially by people in hardware development companies, about the impossibility of eliminating multitasking. 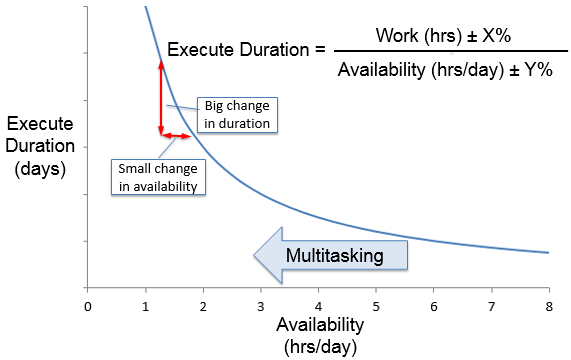 Throughout this post on effective task management, we’ll find common ground that allows us to see and eliminate the costliest multitasking without going overboard and wasting capacity, delaying production issues, or creating a lot of rework. 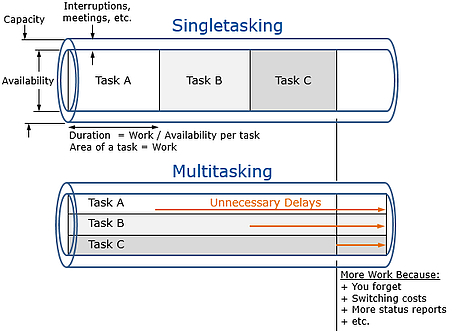 We start with a simplified picture of our tasks, and expand on it through this post and the next. 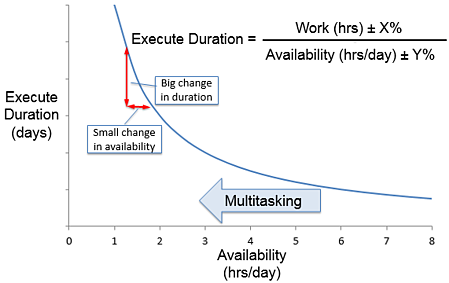 How much earlier did we complete task C by starting it earlier? Answer: We don’t complete C any earlier – we complete it later. How much did we delay A and B by starting C earlier? Note, the directions of the flow in the pictures above are reversed. In figures 2 and 4, we depict flow in the traditional direction: from left to right. 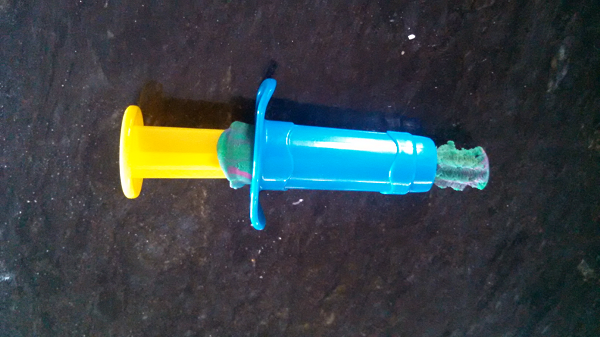 What happens on day 1 is on the far right. 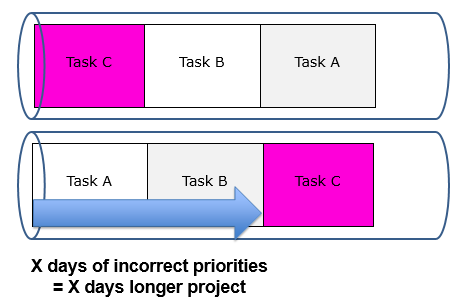 In Figures 1 and 5, however, we show a calendar-day, Gantt-chart view, where flow goes from right to left and what happens on day 1 is on the far left. The figures below also use a right-to-left calendar-day view. Regardless of how it is depicted, however, the effects are the same, so please ignore the differing directions. 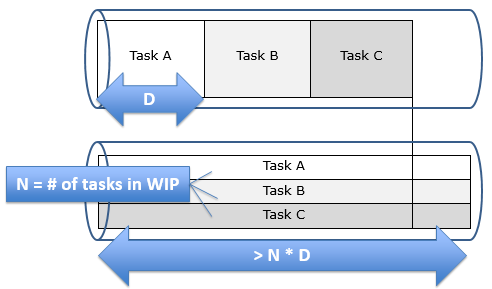 In Part 8 we discuss replacing individual task buffers with shared team buffers. 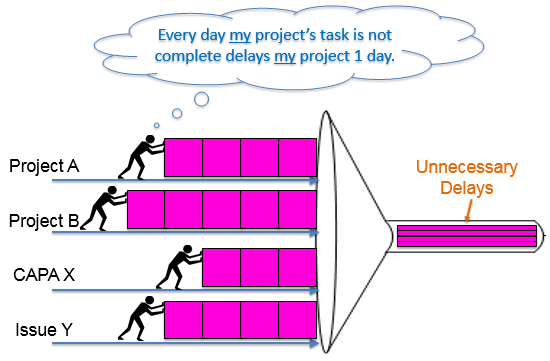 Ready to see two paradigm shifting ideas around what causes project delays?